This man had so many amazing quotes. It was hard to pick just one, but this one spoke to me the loudest. Only light can drive out darkness and only love can drive out hate. Love is the greatest gift we have in this world. It can make us cry tears of joy and tears of sadness. It can make our heart feel as though it may burst. Love can make us put ourselves before others. Love helps us to be kind. hating those that hate does not solve any problems. 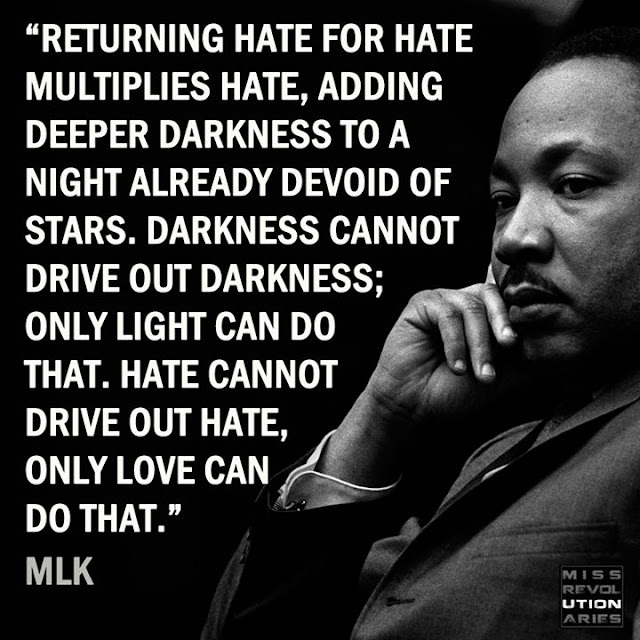 This is so important now (as it was decades ago when Dr. King spoke the words). Our country is so divided and full of opposition. I don't believe in hating. (My kids know it hurts my ears to hear them say they hate something or someone). I have to admit, I question many of my fellow Americans and their standards, morals, beliefs...but hate them? No. Sad and confused, but not hate. My heart would be too full of sadness to hate. I hope 2017 is full of kindness and love. I hope we all drive out the hate with our love.